So, I have the chance to purchase what amounts to the frame of a Razor Ecosmart Metro scooter. All the mechanical items (battery, motor, brakes) have been removed and (as the seller puts it) "it would only be good for one final ride down a steep hill." I'm thinking that this wouldn't take much to turn into a foot-powered scooter (stand on the deck and push off with one foot), but I've been known to be wrong before. Any advice, thoughts, comments, quotes, haiku poetry or other useful information is greatly appreciated. I finally cleared the 10 post limit! Woohoo! I don't know if there's problems with posting to C-list ads, but I downloaded the photo from the ad and it's below. the only thing i see as a problem making it a kick scooter is the deck seems like it would be too high for a comfortable kick action, but i can only go by your pic. never seen one "in person". i guess if so you could cut the upper section away and make a wood deck where the batteries originally sat. that might bring up structural issues though. is it steel or aluminum? i think if i could get it cheap i'd be thinking extend the front section enough to be able to add a bottom bracket and pedals. thinking all out maybe make it electric again but with a front hub and pedal-able like i just mentioned. Well, I bought it. Nice enough guy, he explained his brother's kids had it but left it outside and the batteries froze so he chucked everything that went bad. I was about an inch away from saying no, but he dropped the price by five bucks and I finally said okay. The kids think it's hilarious as is, pushing off with sort of a crab walk position and ever so slow coast on a flat street. There are two, maybe three possibilities. I'm in agreement with a crank and pedals as the most direct way to move it. I thought it could be a direct drive like a tricycle, but the small wheel diameter makes it tricky to balance; adding the attempt to pedal may make it near impossible. Possibility two could be a re-electrified version. With that, I'm completely out of my element. Motor size, torque, battery size, etc. I got nuthin'. 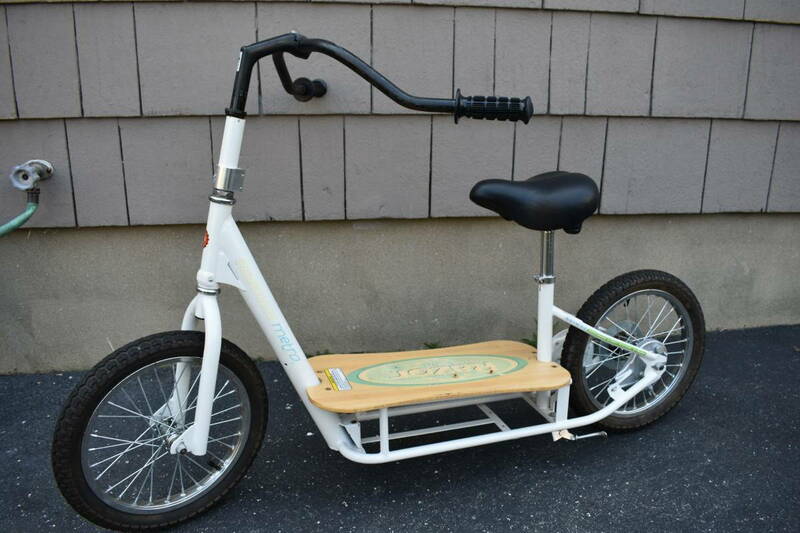 Final choice would be to Frankenstein this into a bakfiets-style bike. Chop off the handlebars, remove the deck, attach it to the front forks of another bike frame, blah blah blah. Too much work for too little benefit. So I guess it's studying option one and two. I tried working with it in my head but no it should be trashed.